One hundred twenty five years ago, a group of people met with one thing on their mind: How can they use their favorite hobby, singing Polish songs, and share it with others. They spoke to their friends, who in turn spoke to their friends and the Polish Singers Alliance of America was born. Over the years, many things have changed, but the one thing that all the members of the PSAA enjoy doing is singing. And in the spirit of competition, they meet every three years to show what they have mastered. They come from New York, New Jersey, Connecticut, Ontario (Canada), Chicago and of course, Michigan. For over two years, members of the choruses that reside in the state of Michigan (District IV) began their work: Club Filarets Mixed Chorus, Filarets Male Chorus, Filarets Female Chorus, Polonaise Chorale Mixed Chorus and Polonaise Male Chorus. Meeting on a regular basis, the various committees began working on their part of the Memorial Weekend. What we worked on for all that time finally arrived. We began meetings on Thursday, May 22, 2014, reporting the accomplishments of the member choruses, and National Officers reported their efforts on behalf of the organization. A popular topic of discussion was the need for more choruses to compete for prizes and the need to recruit membership. Suggestions included enticing sponsorships of youth choruses, and promoting more choral presentations at local events. Before the meetings concluded, members of the various choruses began to arrive: a bus from New York, several members flying in, a bus from Canada, by car and another two busses. Saturday morning brought the reason we were here: the Competitions. After a brief “warm up”, one by one, the Choruses went before the judges; five of them to be exact. The areas being judged were: tone, intonation, tempo & dynamics, diction, rhythm, ensemble and interpretation. Everyone wondered “How did we do?” Speculation was everywhere, but no one would find out the results until Sunday morning. A very well kept secret by President Wyrobek. Saturday afternoon brought the general rehearsal for the Gala Concert on Sunday. Imagine over 300 voices in a hotel banquet room! It was jaw dropping! We really couldn’t wait until the actual Concert that would take place on Sunday afternoon. Saturday evening brought a break from the nerves. A Grand Ball with dinner and dancing to the David Neubauer Orchestra. It was a throwback to the days of the Grand Ball Rooms of the 40s & 50s. Dozens of couples waltzing around the floor, followed by a polka, fox trot or tango. What a grand time! I can’t remember when the dance floor was empty. Sunday morning came and we all learned the results of the Competition. First came the Female Choruses: Third Place: Polonia-Paderewski from New Britain CT with a score of 95.178. Second Place: Filarets Female Chorus from Detroit MI with 95.357 points. First place went to the Marcela Kochanska-Sembrich Chorus from Philadelphia PA with 95.60 points. Male Choruses were next. Third Place: Chopin Chorus from Passaic NJ with 94.68 points; Second Place, Oginski Male Chorus from Hempstead NY with 95.14 points; and in First Place was the Filarets Male Chorus of Detroit with 97.71 points. Finally, the Mixed Chorus winners were announced… Third Place: The Chopin Singing Society of Passaic NJ with 94.61 points; Second Place: the Aria Chorus of Wallington NJ with 96.24 points; and First Place went to the Filarets Mixed Chorus with 97.43 points. Needless to say, Detroit did us proud! Honorary Membership was bestowed on Jadwiga Chudy, Dolores Czaplicki, Wanda Jurgasik, Michaelene LaNave, Jan Milun, Teresa Plawska, Bogdan Rozewicz, Eugenia Slomiany, and Mary Lou Wyrobek for their work in continuing the mission of the P.S.A.A. in promoting Polish culture and music. 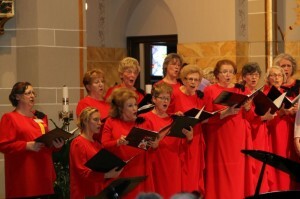 The next chapter was the Grand Concert that also took place at St. Florian Church. Vocal presentations were made by each individual chorus and joined performances in each division (Male, Female & Mixed). The audience enjoyed performances of “Ej, Przeleciał Ptaszek”, “Ojcze Nasz”, “Leciały Żurawie” and numerous other songs. Each song was followed by boisterous applause. But none could compare to the songs that were sung by the 300+ members of the choruses that attended the Convention, with the accompaniment of a Chamber Orchestra, and under the direction of Dr. Thomas M. Witakowski of New York. He directed the four final songs of the concert: “Górą Pieśń Polska” (The PSAA Motto) by Eugeniusz Walkiewicz, “Nie Lękajcie Się” (Do not be afraid) by Piotr Pałka, “They Call It America, But I Call It Home” by Alfred Grant, and the “Processionale” by Piotr Górecki who passed away a couple of days before the Convention. The emotional closing of the Concert brought tears to many an eye in the audience and among the participants. Also announced at the Concert was the winner of the Hlond trophy. The trophy is a chalice given to the PSAA from the interwar Polish Government in the name of Cardinal Augustus Hlond and embedded with rare coins. The trophy is awarded to the chorus that scores the highest in points during the competitions. This year, the Hlond Trophy was awarded to the Filarets Mens Chorus of Detroit. Being a local chorus, the audience showed their approval. Dr. David Troiano received the Mazurek Award for achieving the highest points. Load the busses (again), set the GPS, and everyone was on their way home. But with every song, every chorus looks forward to the next convention, the next competition. 2017! That day will come all too soon. The work begins… new songs, new challenges, get new members! Fun times, wonderful memories, old friends, new friends! Only three years away! I can’t wait!